Invite a friend. Make a beeline for the sticks on NBA Jam ’93. Come back from 17 down on Gary Payton and the Seattle SuperSonics. Win by two. Watch your friend bury his face in his hands. The only thing sweeter than his tears is the cider. You have two dozen to choose from (and 124 other games). When X played the Kessler in May, at the tail end of its 40th anniversary tour, the legendary L.A. punk band continually marveled at the intimate Oak Cliff listening room, calling it one of the best places they’d played. Good enough for us. With an eye-catching mix of out-of-towners, Park Cities barons, and young women looking for sugar daddies all nursing impeccable cocktails against a dimly lit backdrop of oak-paneled walls, books, and oil paintings of English hunting landscapes, The Mansion reliably delivers the main thing you want in a hotel bar: the feeling that, when you walk in, you could be anywhere or anyone. David Lynch meets John Waters in this mod little gay bar around the corner from The Texas Theatre. It has one of the best jukeboxes in town, but people come for the free karaoke hosted by Dee Dee Williams, starting at 9 pm on Thursdays and Saturdays. Author Willard Spiegelman described the Round-Up best: “Gay for the most part, but everyone is welcome; everyone goes away amazed.” That’s because most evenings, aside from Mancandy Sundays, you’ll find couples of all persuasions expertly two-stepping the night away on the sunken wood dance floor. 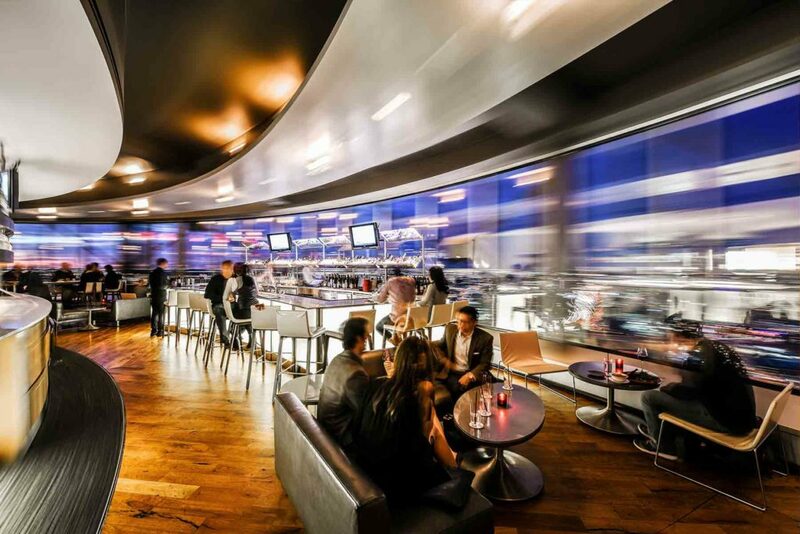 Don’t let the touristy nature of Reunion Tower prevent you from heading to Five Sixty for a drink or two. That said, you will definitely see sights as you sip perfectly executed cocktails in the lounge of this sleek Wolfgang Puck restaurant, which rotates 560 feet above the city streets. 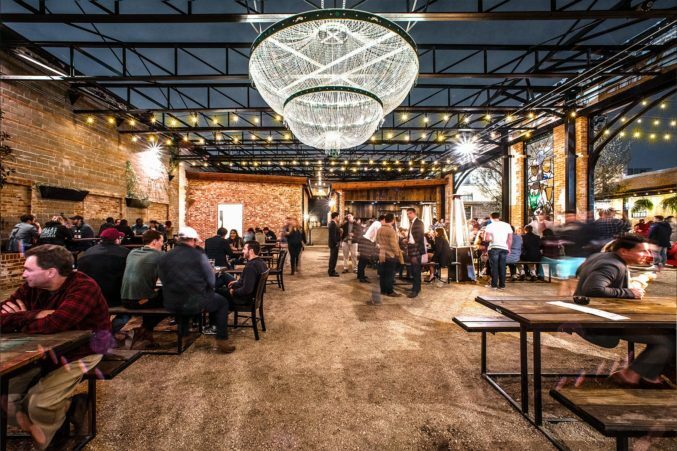 Bonus: it offers one of the best happy hours in Dallas. We need dives. Real dives. Places like Fireplace Lounge, where a bartender has the tenure to remember Dirk Nowitzki’s Würzburg buddies coming in three nights in a row in 2006 during the NBA Finals, and he has a sticker to prove it. Your favorite local band plays here after they outgrow the house shows, but before they’re too big to drink cheap beer with you before, during, and after their performance. Three Links has the intimacy of a living room, but with the benefits of a professional sound system and well-stocked bar. Posted up on McKinney in Uptown since 1991, Christies’ dark mahogany walls contain endless flat screens. That makes it a good sports bar. What makes it a great one is the classic pinball machine, a couple of really nice pool tables, and better-than-they-need-to-be cheese fries. Do the shot out of the ice “glass,” and then throw it at a target on the flower wall—your night at this raucous cap to the Dallas Art Fair has just begun. 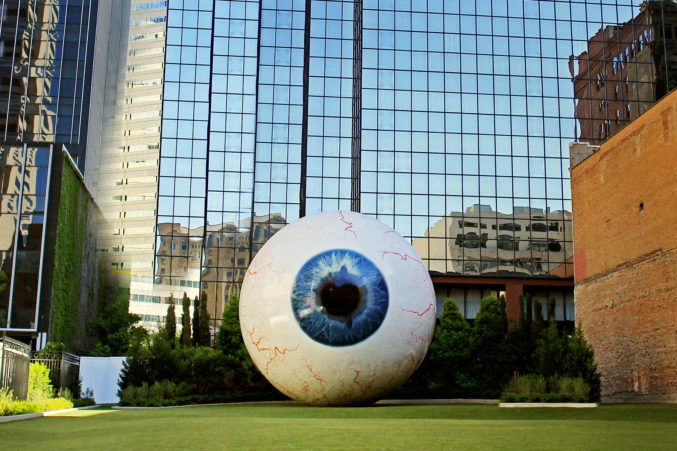 Make the rounds on the lawn in front of Tony Tasset’s 30-foot Eye sculpture. Grab a tequila and dodge the 20-foot skeleton on stilts. Dig into some elotes. Go for a swing. Ogle the look-alike model bartenders. The only thing more over the top is the next day’s hangover. This 24,000-square-foot dance club has more than enough space for you to spread out and break into your highly rehearsed bathroom-mirror moves. Those who require a bit of liquid confidence can line up at one of the club’s 15 service wells before hitting the floor, which stays open for dancing until 4 am on Fridays and Saturdays. Your dog will love this expansive gravel patio. In the winter, he can cozy up next to one of the fire pits, or he can sprawl on his belly under one of the large wooden picnic tables and listen to live music as you scratch his head and feed him pieces of your burger. It’s a half-pound patty, after all. You’re (probably) not going to eat the whole thing yourself. Or maybe you will. No judgment. Geeks Who Drink at Community Beer Co. True trivia enthusiasts don’t mess around. That’s why they head to the Design District for Geeks Who Drink trivia on Wednesdays at Community Beer Co. 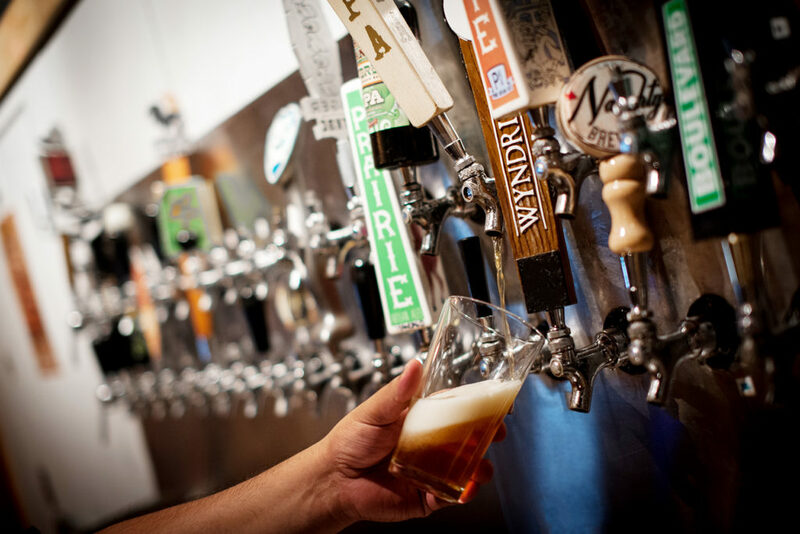 The quizzes are challenging and well-rounded, and the brewery churns out some of the best beer in North Texas (we recommend the Mosaic IPA), and even dogs can tag along. Doors open at 5 pm. Forget the bars that offer 100-plus drafts. Look instead to Strangeways and its tight and tasteful rotating selection of 40, where local favorites (Oak Highlands, Peticolas, Small Brewpub) are joined by world travelers like Italy’s Birra del Borgo Caos wild ale and the limited Tropical Tripel from Belgium’s De Proefbrouwerij. Better: bartenders who can talk knowledgeably about each and every one. This East Dallas dive is known for its late-night, off-menu jalapeño cornbread-battered corn dog. But this is by no means the only worthwhile bar bite. Try the burger. A 6-ounce ground beef patty topped with lettuce, tomato, pickles, and your choice of cheese. We suggest cheddar. The crispy, beer-battered onion rings are the perfect accoutrement to a heavy-handed pour of whiskey. At The Joule’s basement bar, the crowd is just as aesthetically pleasing as the decor, and the craft cocktails are truly inspired. Go for the Old Fashioned; stay for the cocktail menu’s seasonal offerings, peppered with exotic ingredients. A massive chandelier hangs from the open-air roof in the courtyard, sparkling over rows and rows of wooden tables as well as a few trees and Adirondack chairs. 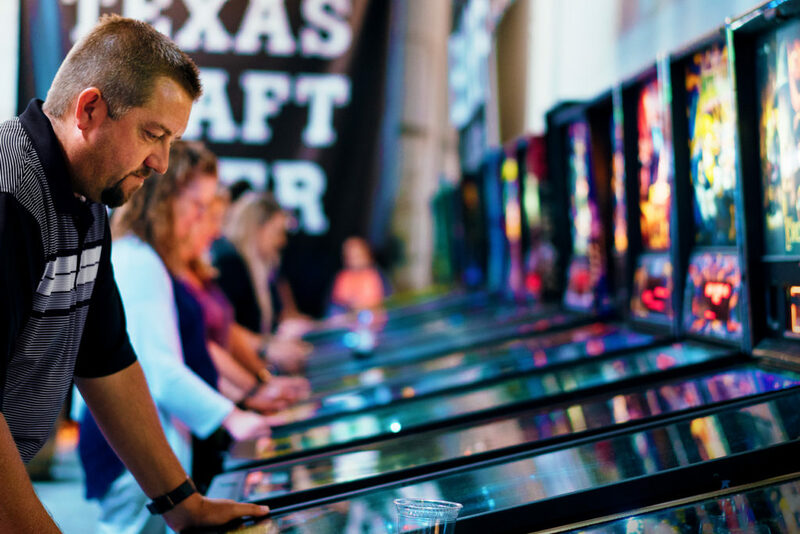 Triple-digit beers are on tap, and if the yard happens to be empty (unlikely) there’s a stained-glass mural of Dallas athletes to keep you company.